With 2019 just around the corner, you may have a resolution to fix your finances. If 2018 left you in debt, stressed out, maxed out, freaked out or just ready for a change, read on. You would be AMAZED at what you can change in a year. The person you are today, does NOT need to be the person you are 12 months from now. There are so many ways to go about doing this: loans, refinancing, a second job, starting a blog or becoming a freelance writer, transferring credit card balances, seeing a financial counselor, etc., etc., ETC.! But those aren’t particularly easy and they certainly are not a way to get quick cash. 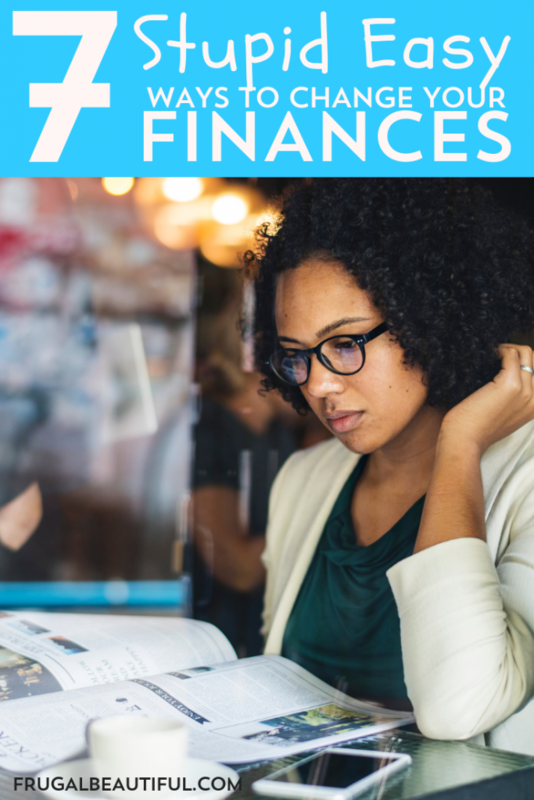 That’s why I’ve created this list of 7 stupid easy ways to change your finances. Each option is a simple and fast way to start on the path to financial health. You can pinch pennies aplenty, but if you’re not making a lot to begin with, you’ll find it’s challenging to get ahead. If you can squeeze in some extra time in nights and weekends, earning a few extra bucks can be a game changer. Enter, the survey side hustle. Online surveys are an easy and convenient way to earn a few bucks from the comfort of your couch. Keep in mind, though, that they do require you to pay attention and actually read each and every question. The company can tell if you just fibbed your way through the survey and will not pay you for it. They may even remove you from their program. If you are suffering from low or even no credit, it’s important to keep an eye on your credit score. Not only will this allow you to see your progress, it can also help you catch any errors or inconsistencies. While you are entitled to a free credit report from each credit reporting company (Experian, TransUnion, and Equifax), Credit Sesame is my preferred monitoring program. Not only is it free, but you can check your credit report and score as often as you like. Pretty snazzy, ey? It be totally scary to look at your credit score, I get it. But knowing what’s negatively impacting you NOW can help you in a year’s time when you go to make a big purchase. Follow these steps to earn some money and trim expenses, but also make sure you understand your score and how to improve it! Money-saving apps and programs are a dime a dozen these days. I’ve even written about some in the past. But as of December of 2018, my two favorites are Trim and Sift. Using apps on your phone to simplify and optimize your spending habits is a great way to save without breaking a sweat! Trim is an online, desktop based program that automates ways to save you money. After you securely connect your accounts, Trim will inspect each one to determine if there are any potential money saving options. Specifically, Trim excels at examining and notifying you of your recurring subscriptions, discovers if you can save money on your cable, and allows you to automate your savings. You can even request account alerts via text for things like overdrafts, low-funds, or large purchases. Best of all, it is free. Trim takes security very seriously and therefore they have implemented 256-bit SSL encryption, two-factor authentication, and read-only access. Your account info is not stored of their servers. To learn more about Trim or to sign up, pop on over here. Sift is an app that focuses on your credit cards and their purchases. Named as one of Google Play’s Best Apps of 2018, it maximizes your cashback and rewards, while tracking all the benefits available for each of your cards. It will automatically update you on any perks that may be available to you due to using a specific card. For example, theft and damage and warranties, time left to return, and price protection. The latter is my favorite perk, as it will help you save money on previous purchases if you used certain cards when buying an item that has decreased in price. As for Sift’s security, information is transmitted securely via SSL (TLS 1.2) bank grade encryption. All of their servers and databases have very strict access control and all data transmitted and stored is anonymized. To give Sift a try, check it out here. When was the last time you evaluated your savings accounts? Do you know what kind of interest you are earning on your funds? If you use a big bank, with lots of brick and mortar locations, it is likely you aren’t getting as much as you could. Solve that problem by considering an online bank. My favorite is Capital One 360. Not only will you receive up to a $100 bonus when you open an account, but because they don’t have any physical locations, you get a higher yield interest rate. They have a large network of ATMs and offer mobile deposit, allowing you to get most of the benefits of a typical bank with less fees and a higher rate on your savings. As mentioned above, online surveys are a nice way to change your finances by earning some quick cash. But the internet has more to offer than that. For example, Swagbucks is an easy way to earn gift cards. Swagbucks offer the typical surveys, but they also reward you for watching videos, shopping online, and more. It’s totally free and you can redeem your points earned for pretty much any gift card out there, including MasterCard. If you want to earn some major cashback on your online purchases, you’ve got to give Ebates a try. Depending on which merchant you buy from, you can get up to 50% back. As a good example, when I switched from AT&T to Verizon for my mobile service, I got $75 cashback just for shopping through Ebates. That was a pretty outstanding month, but I typically reel in at least $20 a month just for shopping at online stores I already planned to buy from using Ebates. You can’t change your finances for the better if you aren’t sticking to a healthy budget. 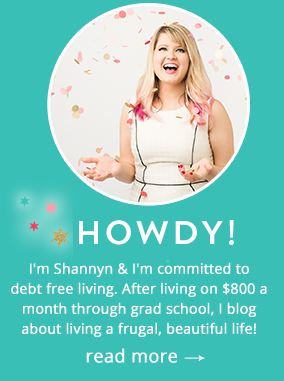 I talk a lot about budgeting here at Frugal Beautiful, but my post How to Fall in Love with Your Budget is particularly useful. Once you’ve read up on the subject, consider an online budgeting software like Mint or Personal Capital. It is easier than using pen and paper, especially on the go. I use both of these apps. I love that Mint has a little doughnut chart that shows me how much I’m spending in each category (sometimes it’s horrifying!) and that Personal Capital shows me the overall picture of how I’m doing to track my net worth. It’s super motivating! My personal favorite way to improve one’s personal finances is to find a side hustle. I’ve written extensively on my most profitable side hustle: Airbnb. Seriously, without the money I make hosting travelers on Airbnb, I’d be in a world of hurt. Owning a home has been a much more expensive endeavor than expected, specifically due to a major increase in taxes and numerous repairs not found before closing. Airbnb has helped me stay on track with my budgeting and retirement goals. As of this writing in late 2018, I’m earning over $750 a month just renting out my spare room with minimal work as an Airbnb host. Another quick and easy option is to drive for Uber or Lyft. It’s simple and fast to get started with either company and can bring in some significant cash quickly. Cha-ching! One of my most popular posts is the Mason Jar Money Method. If you’re a fan of the envelope system from Dave Ramsey or have cash on hand, this is for you. You start with a giant mason jar, and just $1. Each week your savings grow from there and you begin to build better habits to make those bigger weeks work- you have about $1300 by year’s end. What could you do with $1300 more dollars in the bank? Maybe put it towards next year’s Christmas gifts and travel? New tires? A vacation? You will be $1300 ahead by this time next year. So, what are you waiting for? It’s never too late to get a handle on your financial life. Hop to it, friend, and best of luck!